Oh hello, everyone! It's Lynnea and I'm back with another project for you! I have a lot of photos to share, so let's just get going! 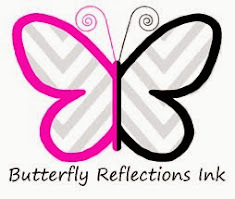 Remember that you can pick up the products I've used for today's cards from the Butterfly Reflections, Ink Shop! 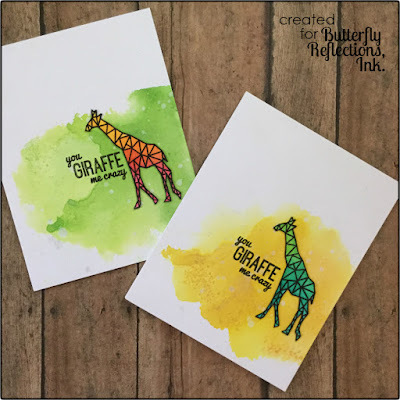 I've used the Geometric Menagerie Stamp Set from Altenew along with some Distress Inks to make this set of watercolored cards. 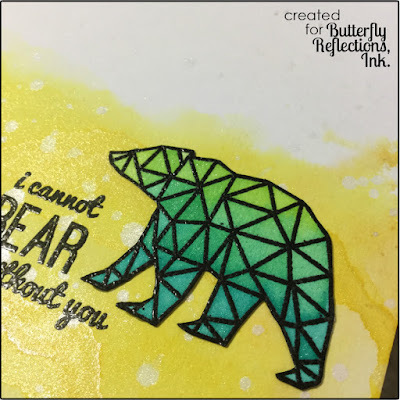 I started by stamping two of each animal from the set with some Versafine Onyx Black Ink and sprinkled on some Hero Arts Ultra Fine Clear Embossing Powder and heat set the powder with my heat gun. I made 6 backgrounds total - 3 green and 3 yellow. I smooshed some Twisted Citron for the green and Fossilized Amber for the yellow Distress Inks onto a piece of acetate and sprayed it with some water that I mixed with Perfect Pearls. I transferred the ink onto some watercolor paper and set the backgrounds aside to let them dry. 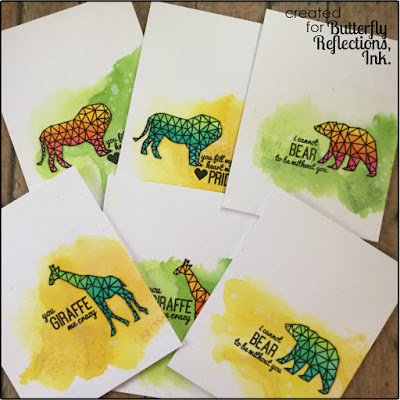 While the backgrounds were drying I started to watercolor the animal images. 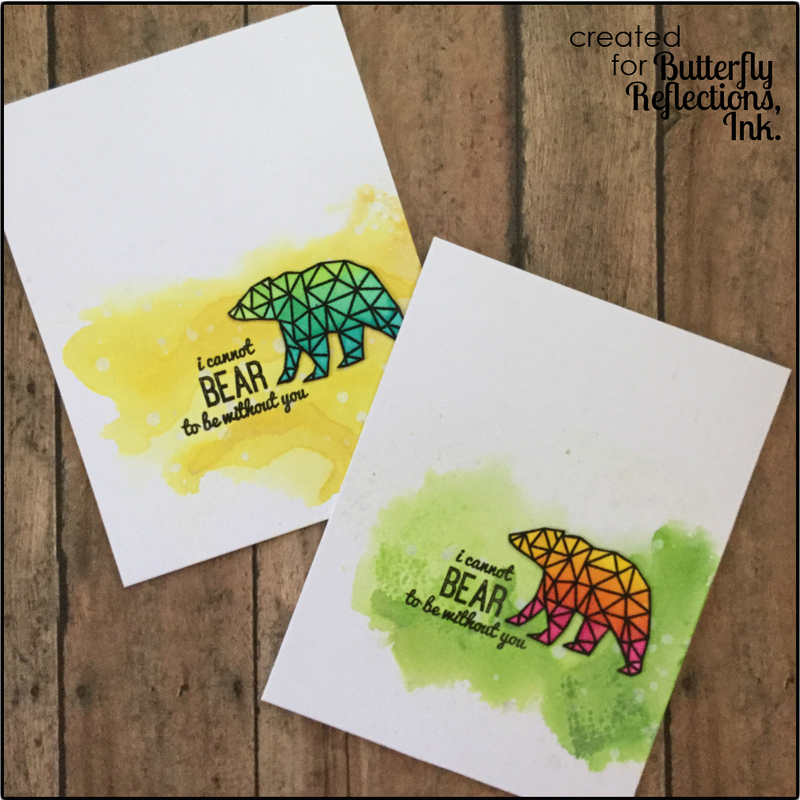 For the pink to yellow ones I used Picked Raspberry and Fossilized Amber Distress Inks. Isn't the orange in the middle pretty?! 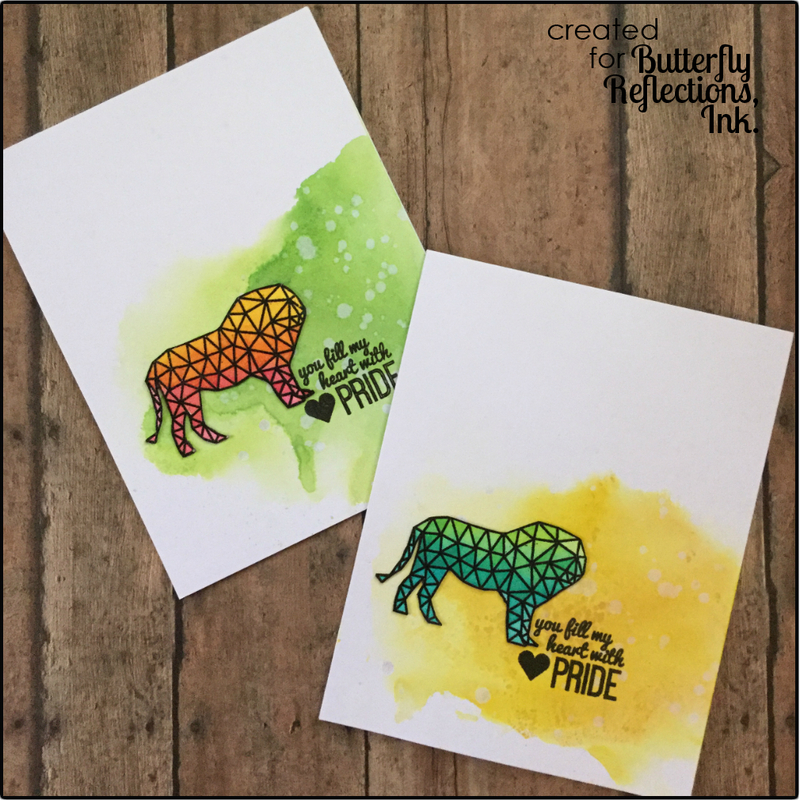 It's just a result of the inks mixing and blending! The blue to green ones are Peacock Feathers and Twisted Citron. I love the pretty minty color in the middle! I used a mixture of water and Perfect Pearls to do my coloring so that I would get some built-in shimmer! Once the watercolor backgrounds were dry I flicked on some water and Perfect Pearls mixture (making sure to get some onto the white portions of the background) and waited about 30 seconds and then wiped up the excess water with a paper towel. I wanted to flick some of the shimmer water mixture onto the white portions so that there would be some added interest outside of the watercolor areas. Look at all of the shine and shimmer! Perfect Pearls are really a girl's best friend! I use them just about everywhere! I cut out the images with scissors so that I wouldn't leave a white border. I wanted my cards to appear one layer without taking the effort of masking and what not. Once I had them cut out I went around the edges with a black marker to make sure there wasn't any white core showing through. I stamped a coordinating sentiment with Versafine Onyx Black Ink onto each background and embossed them with some Hero Arts Ultra Fine Clear Embossing Powder. I glued my watercolor images onto my background with Tombow Mono Multi Glue. And that's it! It really didn't take much time at all to make all six of these cards. Once I have my supplies out it's super easy to duplicate cards and build up my stash. I hope you enjoyed this post! 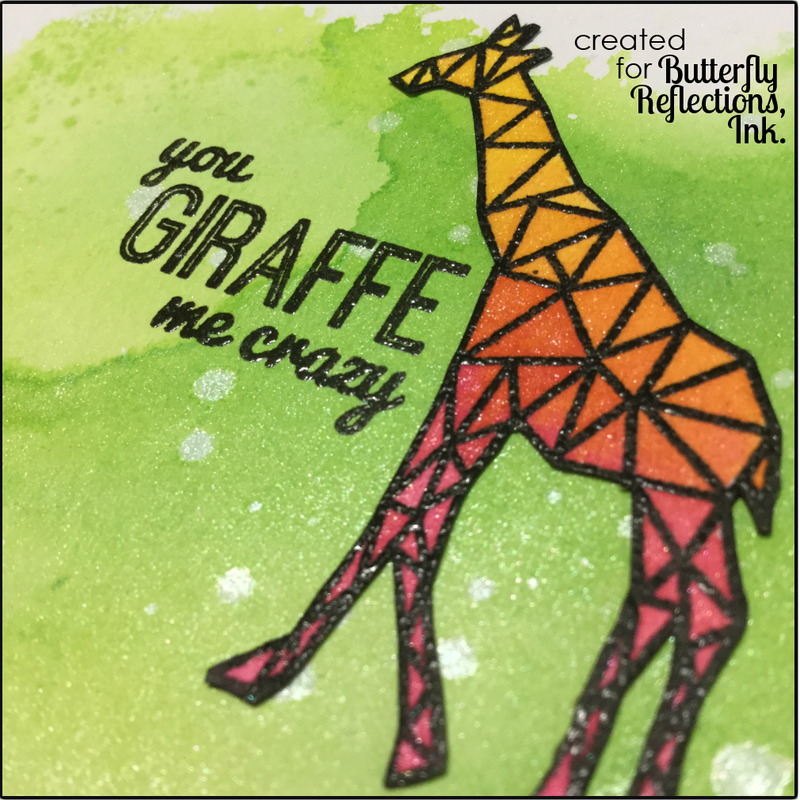 Head over to the shop to get all of your crafty things! I'll see you again soon!